This website is owned and operated by Malone Medical Chambers Ltd. We are very sensitive to the privacy concerns of the visitors to this site and recognise that you are concerned about the information you provide us, and how we treat such information. This statement sets out the basis on which any personal data we collect from you, or that you provide to us, will be processed by us. Please read the following carefully to understand our views and practices regarding your personal data and how we will treat it. By visiting www.malonemedicalchambers.com you are accepting and consenting to the practices described in this statement. 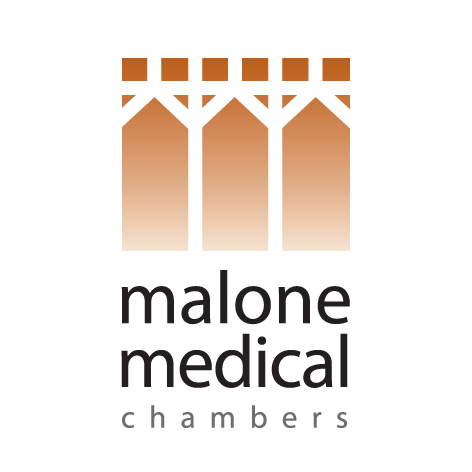 For the purpose of the General Data Protection Regulation (“GDPR”), the data controller is Malone Medical Chambers Ltd, having the address as noted above. We may collect personal data from you, which you volunteer when you provide such personal data to us, or via our services with which you interact. You may give us information about yourself when you enquire about our services and associated facilities and events, complete forms online on our website www.malonemedicalchambers.com or correspond with us by phone, e-mail or otherwise provide us with personal data. Other persons may also give us other personal data relating to you, or we may obtain such other personal data about you as may be provided to us in the course of our legitimate business activities. We may collect and process your data, including the following, in the course of providing services to you, which could contain your personal data. This information may include your first name, surname, postal address, e-mail addresses, mobile and phone numbers, credit card/debit card or bank details and your personal preferences about how your payment/s should be used. When you access our website, your device’s browser provides us with information such as your IP address, browser type, access time and referring URL, which is collected and used to compile statistical data. This information may be used to help us to improve our website and the services we offer and to offer services to you. · Notify you about changes to our activities. Malone Medical Chambers Ltd does not carry out automatic decision-making processing with personal data. · If we are under a duty to disclose or share your personal data in order to comply with any legal obligation, or in order to enforce or apply our terms and conditions and other agreements; or to protect the rights, property, or safety of Malone Medical Chambers Ltd, our customers, our service recipients or others. This includes exchanging information with other companies and organisations for the purposes of national security, fraud protection and credit risk reduction. It is Malone Medical Chambers Ltd’s policy to ensure that your data is held within the European Economic Area (EEA) and consequently would be subject to GDPR requirements. All personal data held by Malone Medical Chambers Ltd is currently hosted within the EEA. However, where your data is transferred out of the EEA, Malone Medical Chambers Ltd will comply with Chapter 5 of the GDPR to provide an alternative method of safeguarding your personal data. The transmission of information via the Internet may involve the transfer of data to countries outside the EEA. This occurs typically through the use of cloud solutions for web hosting, email hosting or proprietary software solutions delivered through the Cloud. We do not, however, authorise any third party involved in this transmission of data to use your personal data for their own purposes. Non-EEA countries may not provide an adequate level of protection in relation to processing your personal data. By submitting your data via this medium, you agree to this transfer, storing and processing and acknowledged the risks associated with such transmission. Malone Medical Chambers Ltd is committed to protecting your personal data from unauthorised access and/or processing and in doing so we use a variety of security technologies and procedures to help protect your data. All information you provide to us is stored on secure servers. Any payment transactions will be encrypted using strong and industry best practice encryption algorithms and techniques. Where we have given you (or where you have chosen) a password, which enables you to access certain parts of our site or systems, you are responsible for keeping this password confidential. We ask you not to share your password with anyone. You have the right to be informed about any personal data which Malone Medical Chambers Ltd holds relating to you, including how we acquired such data, and the purposes for which it is being used. This right requires that you will be given a copy of your personal data which you may have supplied to us via our website or in other correspondence and interactions. To exercise this right, you must make your request in writing, posting it to our address as specified above and including with the request, a copy of an appropriate legal form of identification and a copy of a current utility bill to verify your address. No fee is required for this service. A request will be dealt with as soon as possible and we will respond to your request within one month from the date on which your request was received. In certain circumstances, you have the ‘Right to be Forgotten’. This means that you can request that Malone Medical Chambers Ltd removes any and all references to you from our records and systems. We will comply with all such requests in a timely manner, as required by the Data Protection legislation unless other operational or legal obligations require us to retain such data for a particular purpose or period of time. You have the right, at all times, to object to the processing of your personal data which you find intrusive, excessive or unwarranted. Malone Medical Chambers Ltd will respect your right to do so but may need to continue such processing where required to do to so by law, or within the terms of an existing contractual arrangement. Questions, comments and requests regarding this privacy statement are welcomed and should be addressed to The Data Protection Administrator, Malone Medical Chambers Ltd, 142 Malone Road, Belfast, BT9 5LH. This site is owned by Malone Medical Chambers Ltd. Any of the images and text used in this site may not be used for any purpose without the express written agreement of Malone Medical Chambers Ltd.
Malone Medical Chambers Ltd has worked diligently to provide you with accurate and updated information in this site, however, we cannot be absolutely certain that everything on this site is free of errors or omissions. We will not be liable for any direct, indirect, incidental, consequential, or punitive damages arising out of your access to or use of this site.